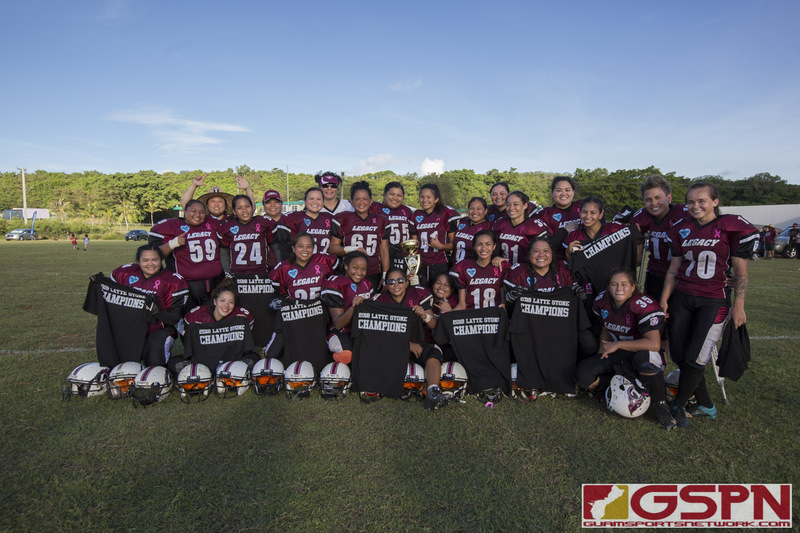 The Guam Women’s Tackle Football League 2018 season came to a close with a thrilling championship matchup between the Island Stunnerz and defending champions Team Legacy Saturday afternoon. After trailing for most of the second half, the Legacy would come through in the final four minutes of the game to heat things up on a 92-yard rushing touchdown and a thrilling defensive stop at the 1-yard line with the final seconds of the game ticking away as the Legacy would win their 7th straight championship with a final score of 16-12. From the opening kickoff, the contest showed signs of being a close one as both teams were neck and neck. Both defenses played tenaciously as multiple turnovers were forced to keep either offense from making any progress. It would be the Legacy who would strike first on a 25-yard run from running back, Olivia Flores Elliot, who navigated her way through the Stunnerz defense to find daylight and sprint into the end zone. Kaylani Martinez would haul in a pass in the corner of the end zone for the 2-point conversion and put the Legacy ahead 8-0. “I knew my team really needed me to get in there and I cut in to the gaps and it was there. We were really fighting and we had a good play up and the defense was where it needed to be. We just were focusing on treating this play like any other play and just doing what we usually do instead of worrying about doing something different, ” said Elliot. With the Legacy striking first, the Stunnerz would need to find some motivation to overcome the deficit. They would find it after star receiver TJ Rodrigues would leave the game on an injury. With their teammate out, the Stunnerz played with a fire as their lightning and thunder running game saw big gains from swifty running back, Lorina Guerrero, and big, bruising full back, Maylani Chaco. The Stunnerz would get on the board as quarterback, Lani Jackson, dialed up receiver, Deniece Padilla, to cap off a 70-yard drive. Padilla answered, hauling in a 33 yard touchdown reception. After another long drive, the Stunnerz would find the paydirt yet again with Maylani Chaco punching in a 4-yard carry in the third quarter. After a 2-point conversion attempt was intercepted by the legacy and returned all the way to the Legacy endzone, the score would lie 12-10 at the beginning of the 4th quarter, with the Stunnerz in the lead. With their championship title seemingly slipping away, the Legacy had to focus on retaining their composure before they would be able to mount a comeback. After doing so, Paige Surbur and the Legacy defense would provide a morale boost with a defensive stop with their backs up against the wall forcing a turnover on downs and a Legacy possession. “When they called the timeout, we brought our defense in and everyone was on edge. We were all tired and the game was too close. We had to tell each other not to eat at each other’s throats. We told each other to stay calm and collected and to just play legacy football,” said defensive end Paige Surbur on what allowed the Legacy to stay poised on their comeback. After the big stop, the next thing the Legacy needed was a big score. Setting up shop on their own 8 yard line with less than four minutes left, the endzone seemed miles away behind a relentless Stunnerz Defense. However, offensive MVP, Jalana Garcia was able to find an opening and took it to the house to give her team 16-12 lead as well as the morale her they needed to defend their title. “ We were down and we had to get back up. For me, the blocks were there and I just took the opportunity that was given to me,” said Garcia on what allowed her to remain focused to take the ball up 92 yards for the game winning score. After reclaiming the lead, the legacy would have to come up with one more defensive stop to reclaim the title. With one minute and 55 seconds left on the clock the Stunnerz would take the ball up at the 35 yard line. After a series of big runs by the full back, Chaco, and a big reception from Jacklyn Cepeda, the Stunnerz would be put in the red zone. They would turn to Chaco to punch them in, but the Legacy defense would punch back harder as they would stop the Stunnerz offense 1 yard out from the goal line. The Stunnerz would be unable to get the ball off as the clock ticked down to crown Team legacy as the GWTFL Champions with a final score of 16-12. “You can’t measure heart. Short, injured, tired, playing both ways, you can’t ask for anything more from these ladies. We weren’t getting the big gains that we’re used to at the beginning, but we knew that we had to keep at it. Our defensive coach had faith and belief in the defense to either win the game or lose the game, and, when you have that kind of faith, you just go with it,” Legacy Head Coach Kin Salas had to say about the effort of his team. The 16-12 win would cement the Legacy’s perfect record with their 7th consecutive win in the 2018 season as well as their 7th consecutive championship title.